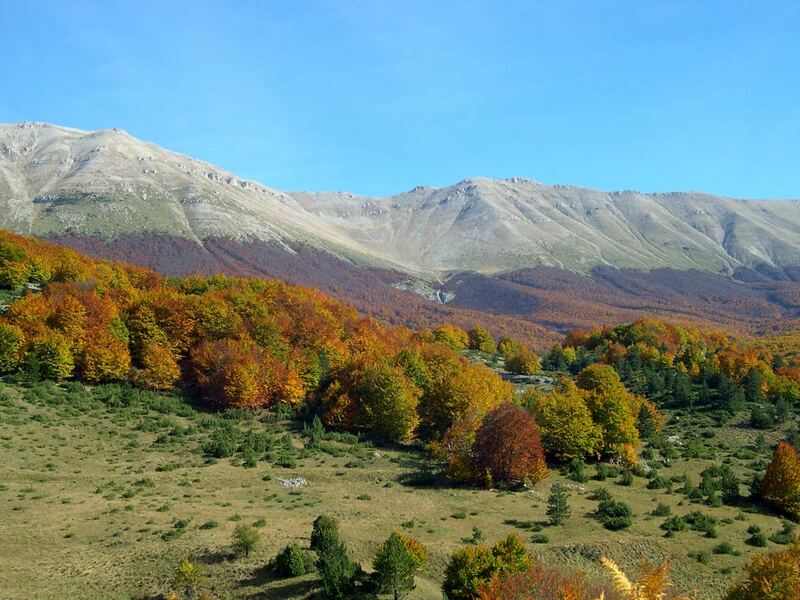 At only a short distance from Rome lays one of the most interesting nature areas of Italy, the Abruzzo, featuring an almost pristine landscape. 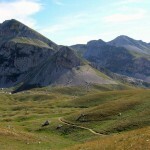 The mountains of the Central-Italian region are part of the Apennine mountain range and count several peaks over 2000m high, including the Corno Grande in the Gran Sasso massif (2913m). In this landscape of wild mountains and rolling hills, wolves and bears still roam. Nature here is overwhelming and now protected by three national parks, very different one from the other. 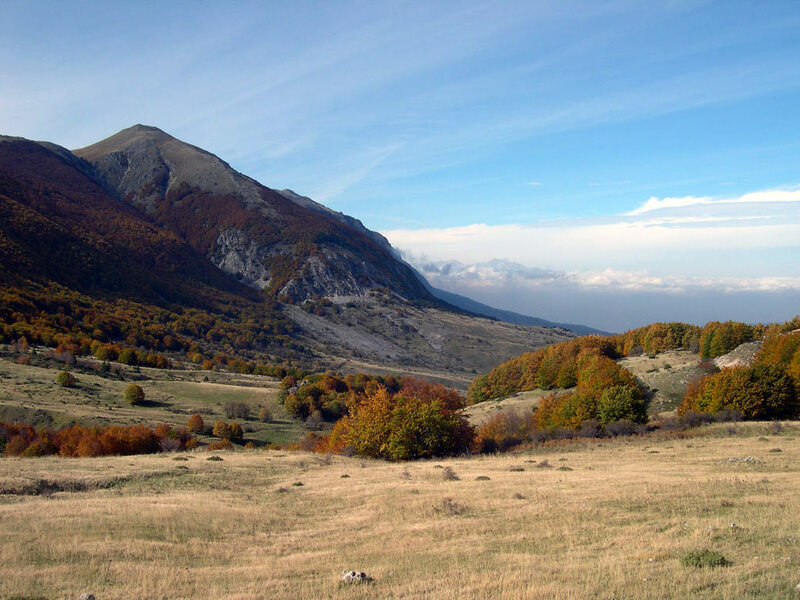 You’ll visit the Gran Sasso National Park, the savage Maiella National Park, dotted with remote medieval monasteries and the Abruzzo National Park, one of the oldest protected landscapes in Italy. 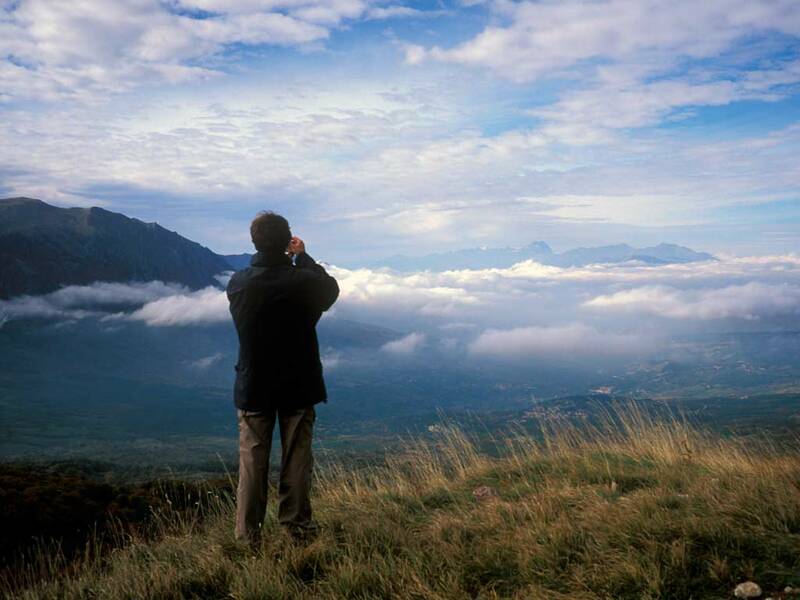 During your tour you will walk through all this abundant nature and you have the opportunity to climb up to the very top of the Corno Grande. 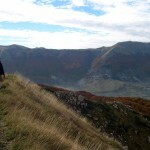 You will walk through the spectacular Orfento Canyon. You will explore the Lama Bianca Nature Reserve and hike on the Camosciara footpath where you can observe chamois roaming in the wild. 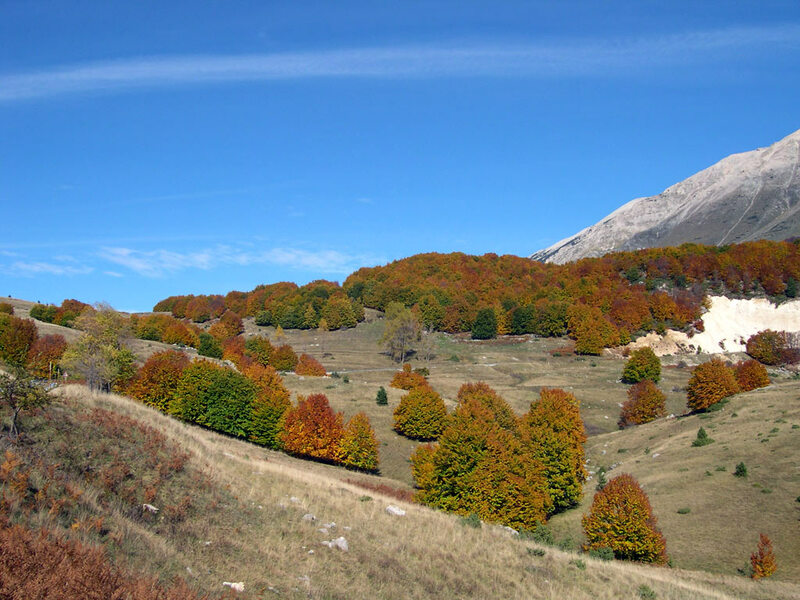 During your walks you will cross meadows full of colourful alpine flowers and wild orchids, while hiking in the woods along small torrents you will admire giant century old beech trees. 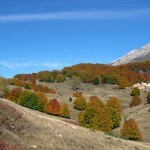 However, there is more than only nature in Abruzzo. You will walk along medieval villages scattered on the hilltops of the area and visit monasteries with beautiful frescos. You will hike through abandoned hamlets squatting under ruinous castles and you will have the opportunity to eat your lunch in the spot where parts of famous films such as “In the name of the Rose” have been filmed! 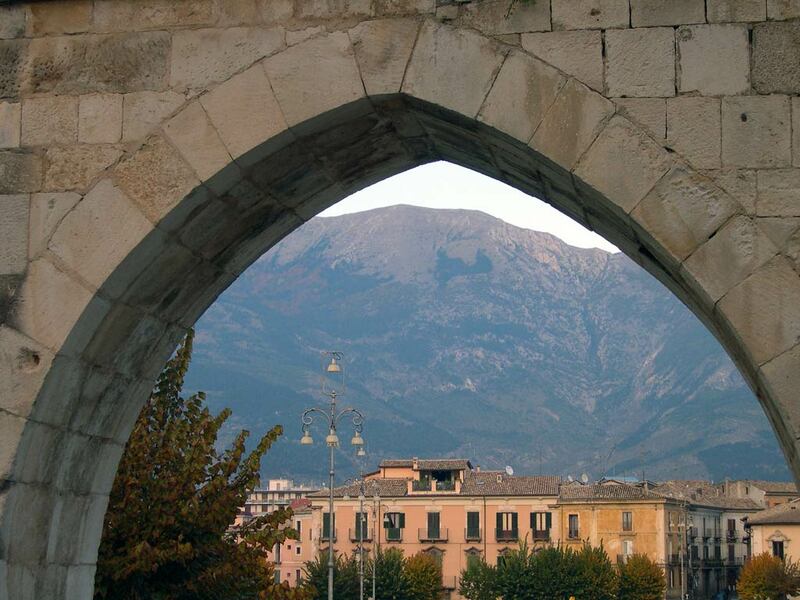 You will as well stay in the wonderful Sulmona, birthplace of the Roman writer Ovidius and one of the most famous popes, Celestine V, named in Dante’s ‘Divina Comedia’. 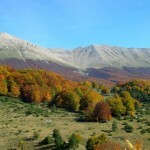 This wonderful mix of pristine nature and many often unknown cultural treasures, represent the real authentic character of the Abruzzo Area, not yet discovered by mass tourism, where a traveller is still treated like a welcome guest. 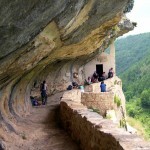 During this tour you can decide independently the skill level of your excursions. Walks follow easy routes without any real technical difficulties and are feasible for all with some walking experience and in a good physical condition. Walking times: approx. 2 to 5 hours a day. 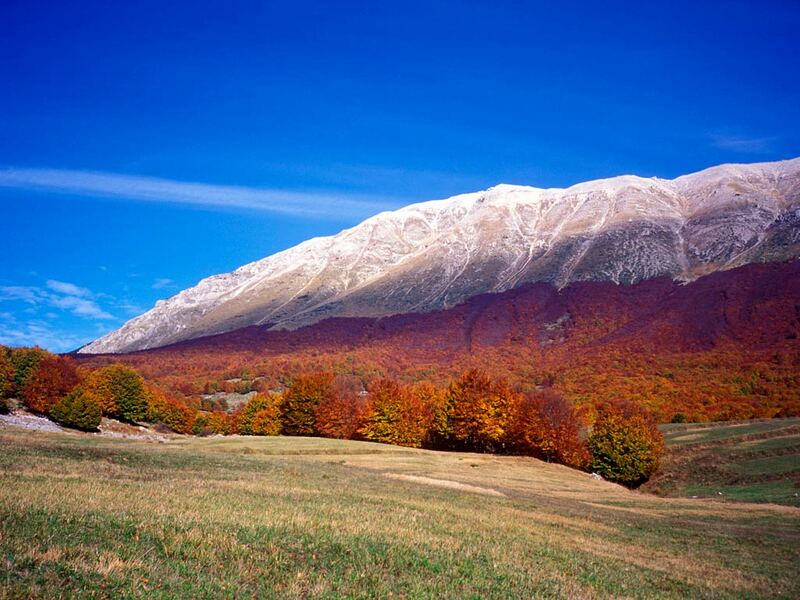 After arriving at the airports of Roma or Pescara, you pick up your rental car and head to the small mountain village of Fonte Cerreto, wonderfully situated at the foot of the ‘Gran Sasso’ (Big Stone). Possibly you arrive in your own car. After having left your luggage at the hotel you can already make a short walk with view of the imposing rock cliffs of Central-Italy’s highest mountain peak. 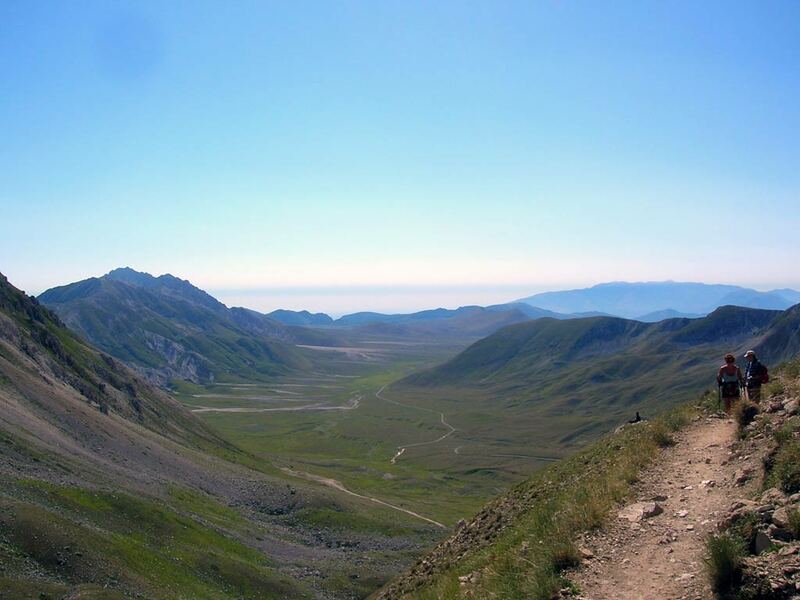 On your first day in the Abruzzo you make a nice round walk on the high plateau of the ‘Campo Imperatore’ (Emperor’s Field). You can either drive up or take the cable car up to the plateau. Here you have several options for a rewarding round walk, depending on your level of fitness and the weather conditions, ranging from really challenging to less difficult or easy walks. 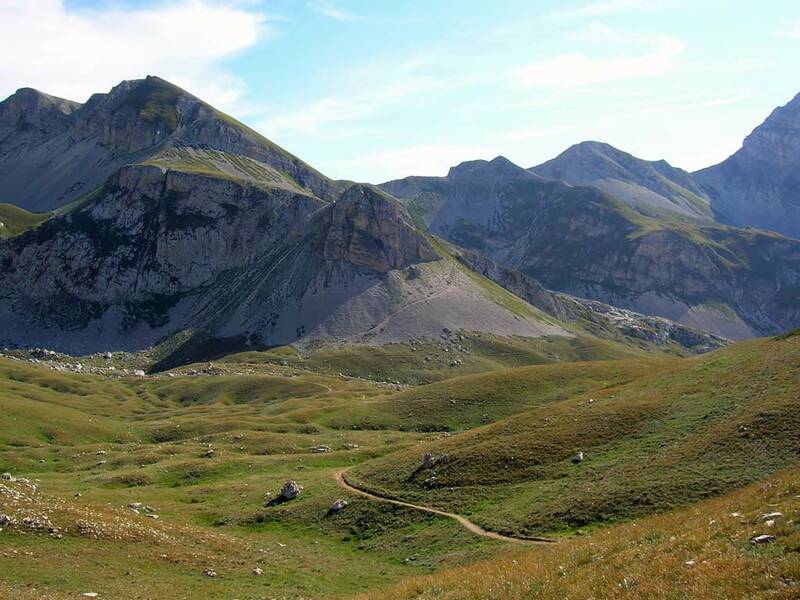 You can opt to follow the ridge towards the highest top Corno Grande (2913 m.), or you can opt for a round walk along the vast high plain of ‘Campo Imperatore’, also known as ‘Little Tibet’. Total walking time: around 3,5 hours/ 8 km. + sightseeing time (4,5 hours/ 10 km. with extra option). 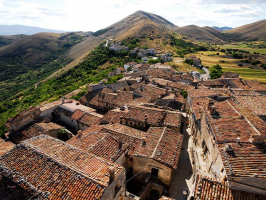 After breakfast this morning you leave Fonte Cerreto and you drive along a wonderful panoramic road over the ‘Campo Imperatore’ down to the beautiful village of Santo Stefano di Sessanio. 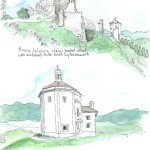 This once abandoned splendid medieval village recently has been completely restored, but sadly has suffered a lot the major earthquake of 2009. 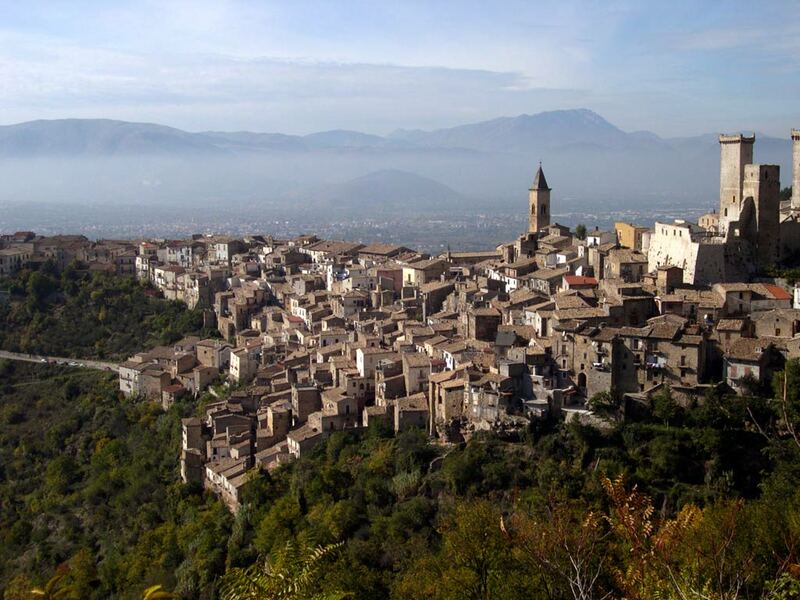 Do take your time to explore the quiet peaceful back alleys of the village, before starting the wonderful, but easy walk through the mountains, to Rocca di Calascio, Italy’s highest village at 1460m, boasting an impressive castle and a wonderful church. Views are grand to say the least! On your way you can enjoy a picnic lunch. 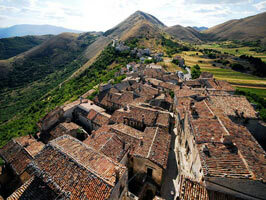 You should of course take some time to wander around in the scenic hamlet of Rocca di Calascio, now mostly abandoned. Then you walk down to the ‘new’ (which in Italy still means medieval!) 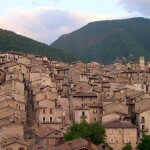 village of Calascio and back to Santo Stefano (optional local bus). There is time to enjoy a drink along the lake, before driving on to the spa town of Caramanico Terme situated in the middle of the Maiella National Park. Here you can already visit the local natural history museum, or simply wander through the old town centre looking for a nice restaurant to have dinner. Total walking time: around 3,5 hours/ 9 km. + sightseeing time (5 hours/14 km. if walking back to S. Stefano). This morning’s walk starts directly from your hotel. You walk to the high end of Caramanico, and after a short visit to the natural history museum (in case you didn’t visit yet) you walk directly into the impressive canyon of the river Orfento. 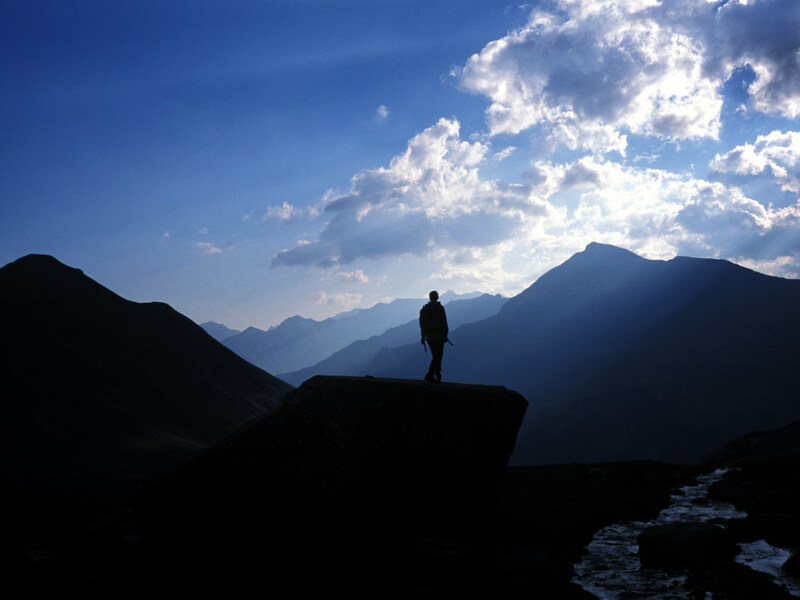 Although the landscape is spectacular and wild, the walk is not difficult. You can have a nice picnic lunch somewhere half way, and then descend along the river. At the end of the canyon you walk through a surrealistic landscape of waterfalls and grotto’s, before returning to the village of Caramanico. 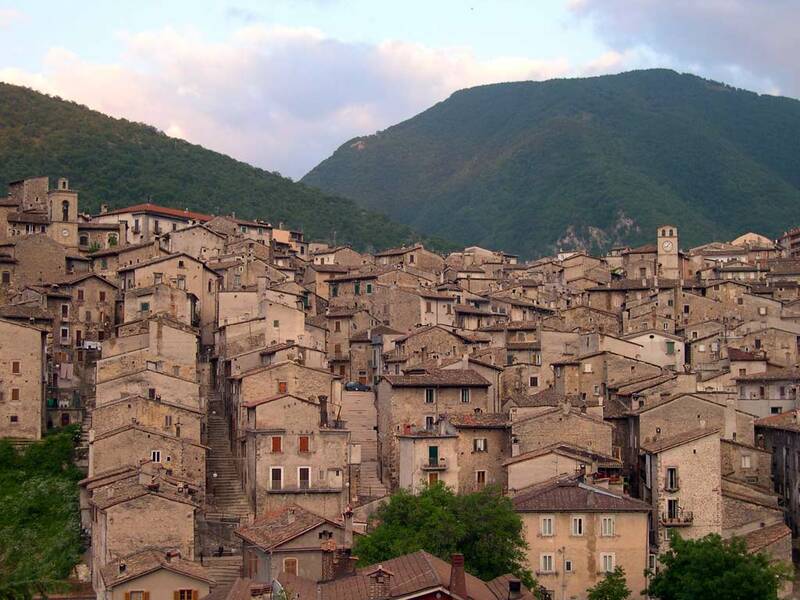 You then climb up to the old town of Caramanico and make a walk through the historical centre, beautifully located on the ridge above the river. The late afternoon is at leisure for a stroll or a drink in the old town. Total walking time: around 3,5 hours/ 8 km. + sightseeing time. By car you make a short drive to the small hamlet of Decontra at the other end of the canyon. From here you make a wonderful walk along some of the many monasteries in the area. First you walk through an open landscape, dotted with several ‘tholos’, strange stone buildings that seem to be prehistorical, but were used by shepherds until only a few decades ago, towards the canyon. Here you’ll visit the beautifully located monastery of St. Bartholomew, one of the most scenic little churches of the region. This is a good place for a first biscuit stop. From here you can climb up again and walk to the Convent of Santo Spirito. 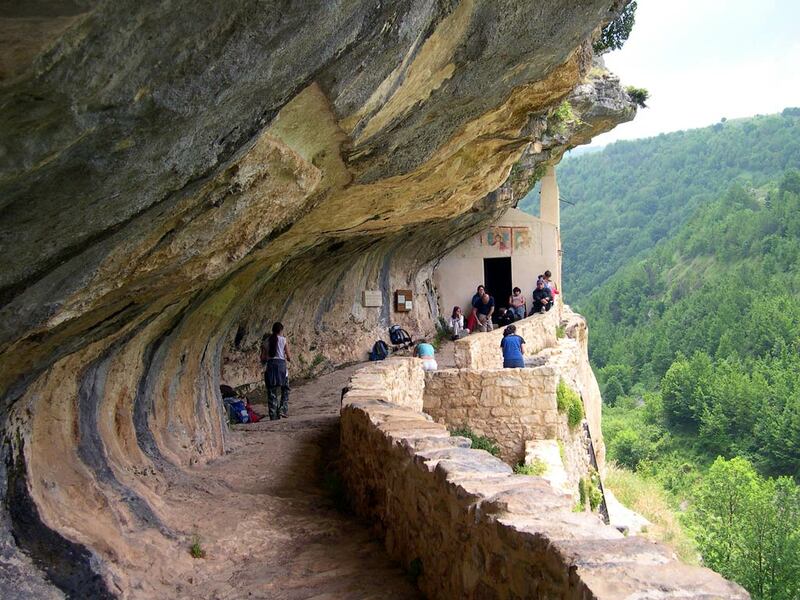 The daring walkers can also visit the isolated cave church of San Giovanni. From here we walk back to Decontra, always through pleasant mountain scenery, and drive back to Caramanico. Total walking time: around 5 hours/ 15 km. + sightseeing time (shorter option: 4 hours/12 km.). This morning after breakfast, you make a short scenic ride through the Orta valley, which separates the two main ridges of the Maiella National Park. There are several shorter and longer walks possible in this area. 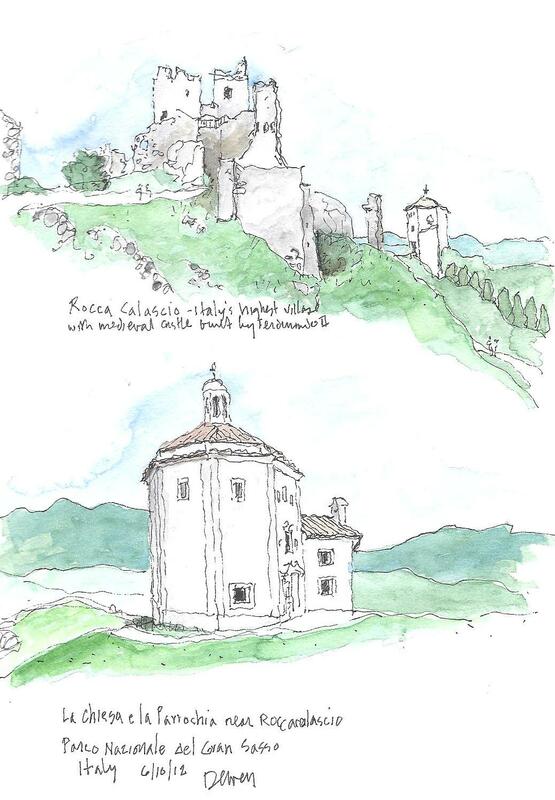 A recommended stop is Rocca Caramanico, a small hamlet towering on a lonesome rock dominating the valley. 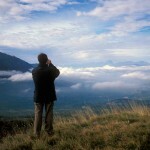 From here you can start your walk along the edge of the mountain range, a scenic walk, without much climbing. Then you start the steep descend towards the medieval village of Pacentro, a very scenic village at the edge of the mountain chain, dominated by the impressive towers of its medieval castle. Take your time to walk through the whole historical centre! 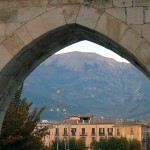 Then you continue down to Sulmona, a beautiful city, surrounded by mountains, and well worth exploring. Our hotel here is located in the very heart of the city, which gives you the opportunity to walk around and breathe its nice atmosphere. In the evening you can go out for dinner in a nice restaurant, which serves some superb local cuisine or opt for a nice pizza on the square. Total walking time: several shorter walks: around 2,5 hours (Roccacaramanico) + 1 hour in Pacentro + sightseeing time + extra optional walk in Lama Bianca (2 hours). 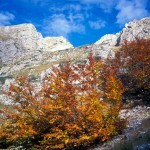 Today you drive by car through the canyon of the Sagittario Valley towards the third and maybe most famous of the national parks in the area, the Abruzzo National Park. 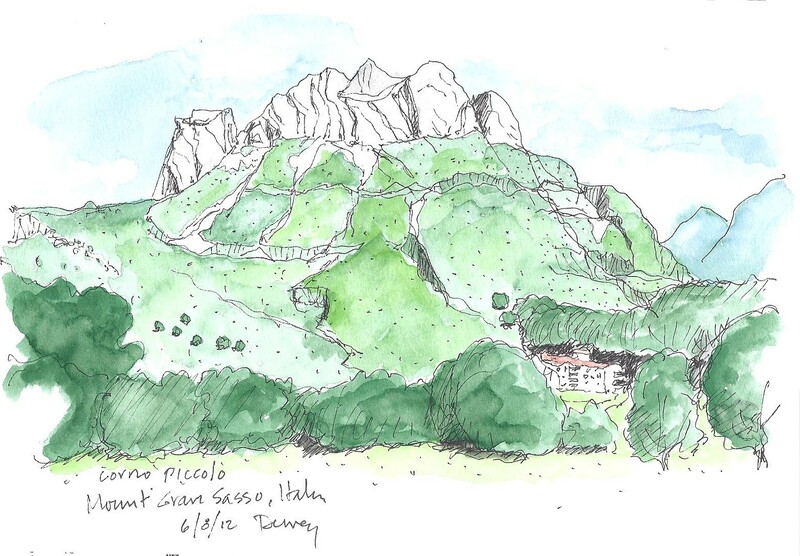 A number of places along the road are worth stopping: Anversa degli Abruzzi, and the tiny hamlet of Castrovalva, nestled on the ridge like an eagle’s nest. From here you can make a beautiful walk along the ridge, through a nice open landscape of mountain meadows and bits of forest, with spectacular views on the canyon. 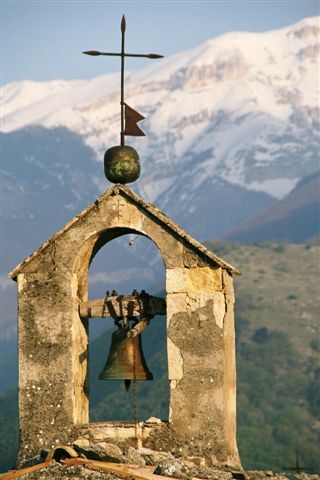 Then you drive on to the village of Scanno, may be the most picturesque village of the Abruzzo range, famous for its traditional dresses of the women, immortalised by the photographer Cartier-Bresson. Take your time to stroll through its characteristic streets and may be have lunch or a drink on a terrace. 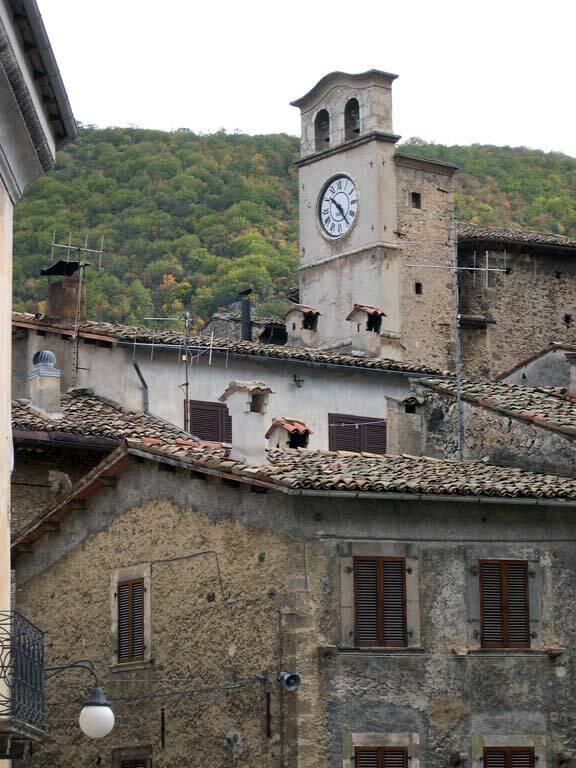 In the afternoon you make a very scenic drive along the Passo Godi, towards the small village of Civitella Alfedena, and then on to Opi or Pescasseroli in the very heart of the park, where you will stay for the last two nights. 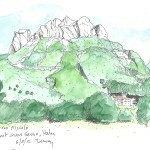 Total walking time: several shorter walks: around 2 hours (Castrovalva) + 1,5 hours in Scanno + sightseeing time + extra optional walk around Passo Godi (1-3 hours). 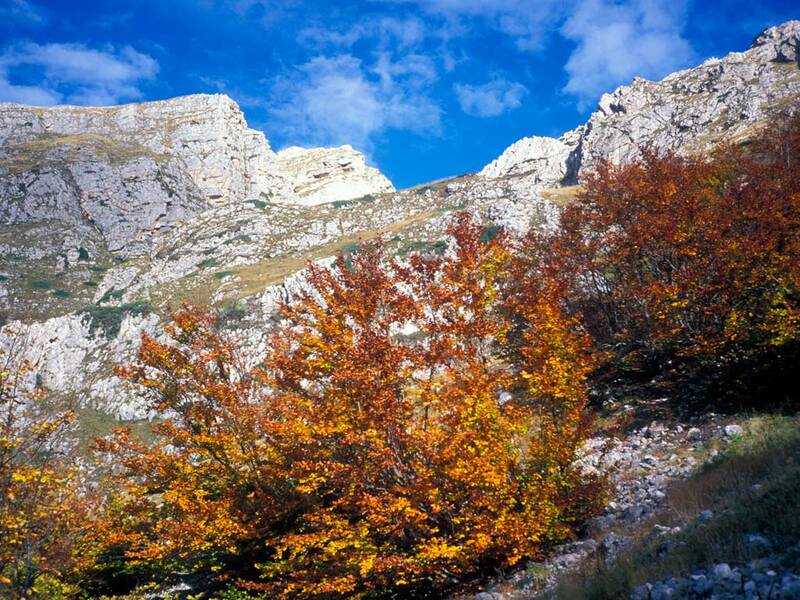 Today you have the time to explore the Abruzzo National Park. A number of wonderful round walks can be made here, ranging from more easy to difficult. 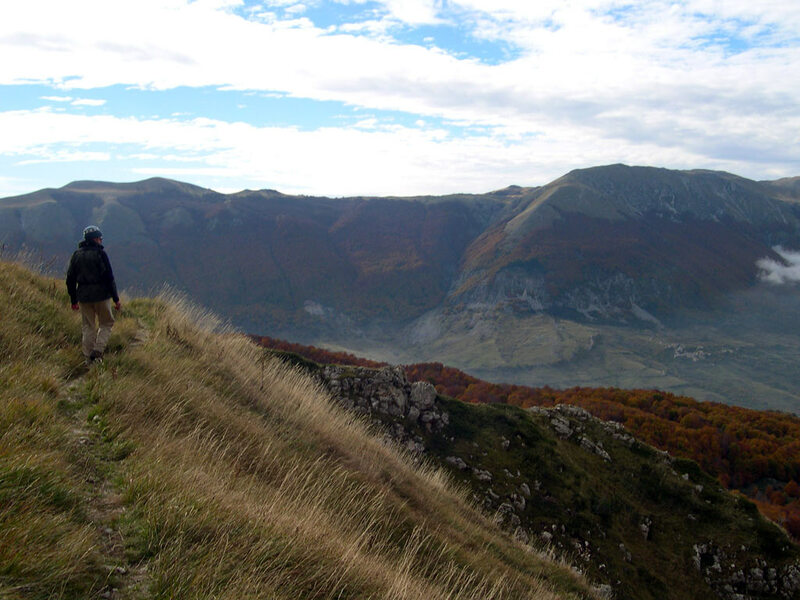 A good option can be one of the most famous trails of the National Park, the Camosciara, where it’s possible to see the chamois freely wandering or in alternative the Val di Rose walk, which start directly from Civitella. 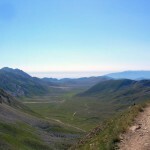 The real hikers can opt for a challenging round walk to the Monte Greco. If instead you want to relax you can opt for an easy walk along the lake and a visit the museum dedicated to the wolf, an animal which still populates the mountains of this area. Total walking time: Many possible options, ranging between 1 – 7 hours. Possibility to combine a few shorter walks. All nights are spent in beautiful hotels (generally 3-star). All rooms have en-suite facilities. Dinners are not included in the tour price, except for the first two nights at Fonte Cerreto. On the other evenings you have an ample choice of good typical restaurants in the towns where you are staying. Nights 1 & 2: The first two nights are spent in a beautifully located hotel at Fonte Cerreto, at the foot of the Gran Sasso Mountains or in alternative in the great historical hotel on the Campo Imperatore (when available). 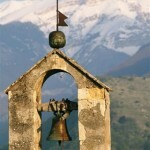 Nights 3, 4 & 5: These nights are spent in a nice hotel in the spa town of Caramanico Terme in the Maiella National Park. Night 6: This night is spent in a central hotel in the beautiful city of Sulmona. 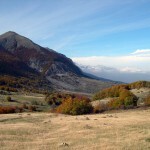 Nights 7 & 8: The last two nights you stay in a nice hotel either in the beautiful village of Opi, or in Pescasseroli in the heart of the Abruzzo National Park. 2 nights Pescasseroli; all nights in good 3-star hotels. Easy/moderate (2/3): Easy to moderate walks without any real technical difficulties. 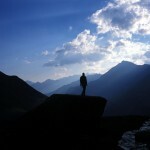 Remember you decide yourself the level of difficulty of your excursions. 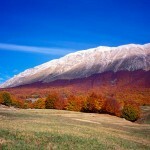 In early spring and late autumn temperatures can be cool. Fitness: All walks are feasible for all with some walking experience and in a good physical condition. During summer you should be able to walk for some hours a day also in hot dry weather conditions. 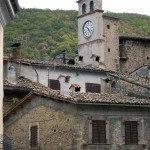 Arrival: The tour starts in FONTE CERRETO. 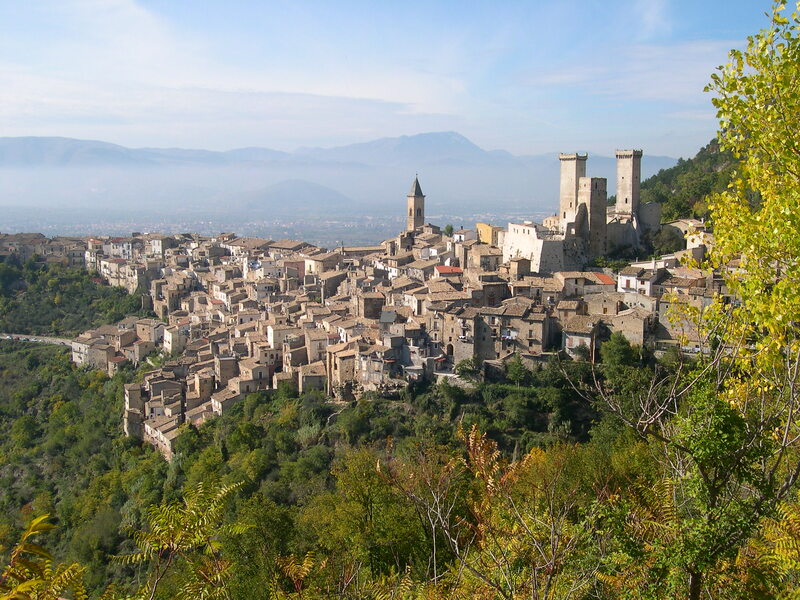 By car you reach the village from Rome (daily flights, also low-cost, from all major European cities) and from Pescara (daily low-cost flights from several major European cities) in around 1,15 hours. Departure: The tour ends in PESCASSEROLI. From here you can reach Rome in around 2 hours 15 minutes, Pescara in less than 2 hours. A luxury version of this tour is also available, with stays in the most authentic luxury hotels of the area. We can offer you a nice selection of ‘Premiere Inns’, very good hotels, many among the world’s best hotels, as acclaimed from Condé Nast Traveler, Travel+Leisure and many others. An examples of a fine hotels in the area is the stunning 5-star Spa Hotel La Réserve in Caramanico Terme. Genius Loci Travel, as the leading adventure travel company in Italy, can book your room in any hotel you could dream of! Details and prices on request. Please contact us to make you an offer. It is possible to extend your tour with a few days at Rome or any other town in Central-Italy or elsewhere in the country. Details and prices on request.